When everyday life problems become not enough for your genius, Ultimate Othello will fulfil your needs for strategic thinking. With its seven difficulty levels, Ultimate Othello is a challenging strategic game. You will also be able to share "Othello moments" with your friends wherever they are thanks to the game's network play. 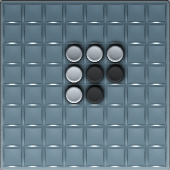 Strategic game: You win in Ultimate Othello only if you use your brilliant strategic skills. Its enhanced AIs offer you the choice between seven challenging opponents who have different intelligence levels. Network play: The network option allows you to play with your friends on the Internet. Nice 3D graphics: Enjoy the game's zen graphics and 3D animations. Multi-platform: Ultimate Othello is available for Windows, MacOsX and Linux, so what are you waiting for! When you launch Ultimate Othello, you are given the choice to play against the computer or to join an online server and play against other people. In solo mode, you can set up the difficulty of the game by choosing between the seven opponents, who have different intelligence levels. After choosing your opponent, the game starts. A board is displayed with four tokens, two for you and two for the other player. The game involves surrounding your opponent's pieces to make them your own. The player that has more tokens at the end will be the winner.